Adding a management accountant to your business team is an important step in your company’s development. For some, this happens organically, when they experience prolonged periods of growth and require specialised financial advice. Other businesses, however, struggle to identify just when they should enlist the services of a management accountant. As a result, widespread issues continue to slip under the radar of even the most established businesses. 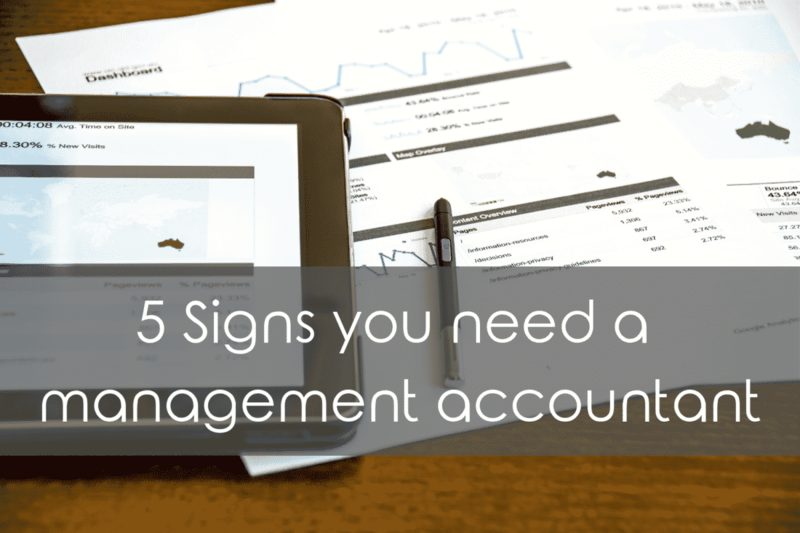 We’ve put together a list of the most common signs that you need a management accountant or part-time finance director. For more information on what a management accountant does for your business, visit our accounting support page. If your business is often reaching for emergency funds, you could be experiencing some serious cashflow problems. These can appear without warning and may have devastating effects on your overall business. A weak financial infrastructure and a lack of control over key operations will damage your growth. Ironing out workflow issues could help release hidden cash, which will improve your cashflow significantly. If you struggle to compile accurate financial forecasts, then you could be in desperate need of a management accountant. A good financial forecast tells you what your most important business goals are. It also allows you to measure your success depending on previous forecasts and quarterly results. This helps to predict and realise sustained business growth. Furthermore, this means you will take better management decisions with a renewed confidence. Additionally, it can also be crucial during funding applications or mergers. A management accountant puts together reliable financial forecasts that don’t just take account of where you’ve been. They also perceptively tell you where you’re going. Whilst no one will know your business as well as you do, sometimes it takes an outsider to fully comprehend the financial workings of your business. You may have a ‘hunch’ about what services or products are important to your business, but an experienced management accountant can help you discover the true value of your different outputs. By focusing resources, manpower, and development funds behind the real growth drivers, you can start to reprioritise the elements of your business for the foreseeable future. A management accountant looks at your company through a critical financial lens – without any preconceived ideas or emotional attachments to cloud their judgement. If this is something your business struggles with, then a shrewd accountant is the next step. How can you know how successful your business is if you don’t view your results in the context of the wider market? Benchmarking is a vital part of financial analysis and will allow you to identify opportunities for growth and counteract threats from competitors. A management accountant is trained in the art of market analysis and helps you set realistic benchmarks against similar competitors. This will heighten your financial understanding and allows you to engage with your own business in a more focused manner. This is especially relevant for growing businesses who have yet to fully experience the volatility of the financial markets or unexpected downturns. It can be frustrating to realise you don’t have the in-house expertise to feel confident making financial decisions. However, by enlisting the services of a trusted management accountant, you will have access to an experienced financial sounding board which can inform important business decisions. It can also help you test out ideas before you implement them. Unfortunately, your business will struggle to make the right business decisions if you lack the appropriate financial knowledge. This is often even harder if your management team is misinformed about your current situation. Investing in the right management accountant is an effective insurance policy against unnecessary mistakes and avoidable financial issues. Accounting should never be an afterthought. By hiring a management accountant or finance director, you know it’ll be at the top of your business priority list, where it belongs. Don’t take risks with something as vital as your business finances. Get in touch with Alpha Financials today. We can help your business take the right steps at the right time. Do your clients pay on time?